We offer lighting installations for customers located in the London and Hertfordshire areas. We’re able to install a range of different lighting systems both internal and external – we serve a range of clients including residential and corporate customers. It doesn’t matter how big or small your job is– we can help! Our experience and training allows us to complete each job in prompt and efficient manner. No matter what room you need lighting for, we’ll be able to help. We offer a no-obligation estimate for every client based in the London and Hertfordshire area. 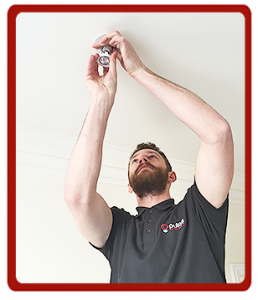 The best way to get an accurate price on your lighting installation is to contact us right away and arrange for one of our electricians to come out to you. In addition to offering quality lighting installations, we also provide a range of other services which include fuseboard installations and upgrades, full and partial rewires and outdoor lighting and power installations. Please see our full range of Services above. Pulse did a small household job very well indeed. Responsive when contacted, arranged to come the following day, were prompt, polite and helpful, made good suggestions to improve the outcome and did a professional job at a reasonable cost. I will certainly call them again! Thank you! After speaking to several companies, I found Pulse Electrical to be the best of them all. There was no silly call out charge to simply obtain a quote. Spoke to John, knowledgeable and friendly, who popped round, viewed the requirement to hard wire our new cooker to the mains supply. Quote arrived promptly, job booked, the guys arrived, did the job and Voila it was done. No crisis, no drama, and well priced. Happy to recommend. ©Copyright 2019 Pulse Electrical. All Rights Reserved.